The whole SUV craze resulted in some truly remarkable vehicles – as well as many less remarkable. The Audi Q2 is one of these small SUVs that are highly regarded, as it ticks all the boxes that a small SUV owner is looking for. It is modern, compact, practical, packed with the latest tech features, it has a manual and automatic options with almost all of its engines and, speaking of which, it has a respectable range of engines. All right, purists may not agree that having the biggest engine option in the form of a 2 l in-line 4 is respectable, but both the diesel and the petrol versions in their top forms have 190 hp. That is not massive, but the small Q2 is no slouch with that kind of power. So, what can Audi Q2 2.0 TFSI tuning bring? A lot! The one we worked on a few days ago is a 2.0 TSFI with a seven-speed automatic. It produces 190 hp from 4,200 RPM and 320 Nm from 1,450 RPM all the way to 4,150 RPM. This wide range of the top torque delivery is very important for the driving feel, especially in everyday driving where both the engine and the gearbox can work in such a way to keep the revs in a relaxed range at all times. This reduces consumption and makes everyday driving more comfortable and it is also something that we appreciate greatly and take into account when we perform our Q2 2.0 TFSI tuning. However, step on the pedal hard and the gearbox instantly complies, shifts down and the car accelerates with reasonable ease. Who would want more? Pretty much anyone who buys an Audi vehicle for what Audi is supposed to be! This is why we are here and the owner of this car came to us with a clear set of requirements to make his already the most powerful version of the Q2 even more powerful. ZIP Tuning Audi Q2 2.0 TFSI tuning project includes several careful changes in software that give the Q2 noticeably more power and put the smile on the face of our demanding customer. The measured power and torque figures came to 264 hp and 408 Nm, respectively. This makes a huge difference in the way the Q2 2.0 TFSI drives after tuning and easily puts it to a higher class when it comes to performance. You keep the low consumption and emissions of the modern four-cylinder engine, but you also get the power of a proper V6. Equally important are the safety and reliability that are preserved at the OEM level, as well as the drivability and the wide availability of torque and power. You can see that in our dyno graph below. But let’s have a closer look at the precise adjustments that add up to the massive power increase. If there is any performance benefit to downsized engines, it is that they are mostly turbocharged nowadays. 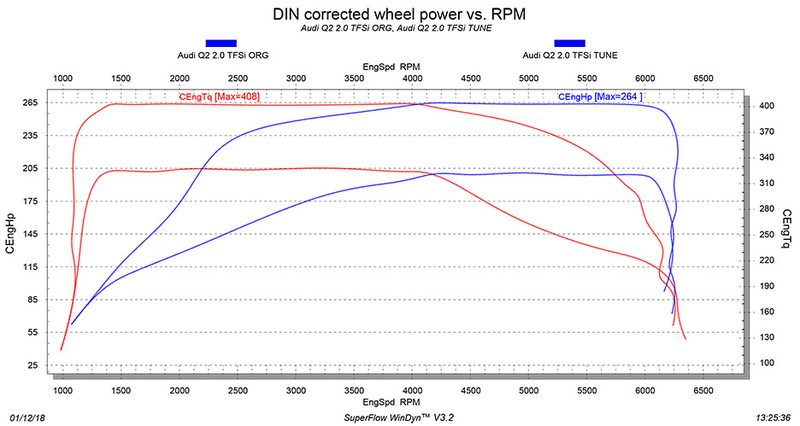 This means that there is far more power and that the torque is available much earlier in the RPM range. These benefits are also partly sourced from the fact that ECU software is now a lot more elaborate and that it allows more precise controls to the experts. This also means that less proficient tuners can cause serious problems, but this is why some of the most revered tuners and thousands of customers turn to ZIP Tuning for service and guidance. The first part of our Audi Q2 2.0 TFSI tuning project comes from the benefit of forced induction we mentioned earlier. It is a change in the turbo pressure. This modification, as well as all others in this particular project, is done through software modification alone. It results in an additional amount of air pushed into the cylinders, which means there is more oxygen to burn. However, internal combustion engines, and especially petrol ones, work best when the ratio between air and fuel is kept at the perfect level. In order to ensure optimal combustion, we needed to add more fuel in order to follow the increase in air delivery. These two actions work together to produce more power. The added fuel and air combust in the cylinders and give the extra power. However, the ‘bigger bang’ in the cylinders has its safe limits. Going too far can cause problems for the intake system, exhaust parts as well as the engine internals. This is why we carefully monitor all changes, track them and perform data logging that, in combination with the experience, expertise and knowledge of our engineers, ensures we can approach the limits confidently, giving you more power than ever, but also never cross them, keeping your Audi Q2 reliable and safe even after its 2.0 TFSI chiptuning process. The measured power and torque ratings come in the form of pretty hefty 264 hp and 408 Nm, but also follow the OEM architecture that ensures a very wide delivery. But this is not all. The two previously described adjustments play the biggest role in the increase in power rating, but the feeling behind the wheel can be seriously improved with an adjustment in ignition timing. We advance it to make throttle response more immediate and the results are absolutely stunning. The engine reacts the moment the pedal is pressed. Add to this the increased power and torque and the driving feel is incredible. It is important to note that going too far with ignition timing advancement is very dangerous for the engine. This is where our expertise and testing come into play again. Advancing ignition timing provides amazing effects and staying within boundaries preserves engine internals. Our expertise allows us to give the best advancement levels without jeopardizing safety or reliability of the Audi Q2 2.0 TFSI. The total result of our Audi Q2 2.0 TFSI tuning is a car that is faster than any of its competitors; a car that is wonderful to drive, very responsive and smooth, but also a car that is completely safe and reliable. If you are interested in something similar for your Audi, let us know and we will make your desires come true. We also provide additional tuning stages for a variety of vehicles from almost any manufacturer in the world and if you are a tuner yourself, you will love our dealer services tailored to make your customers come back for more with every new vehicle they buy.